Suppose you find what you think is a Trident of Nova Pryluka. It is not signed. How do you find out if it really is a Trident of Nova Pryluka? At the moment, there is no recognised Expert for Ukraine Local Tridents so you can't just pay someone to tell you. You can Google "Nova Pryluka" and you will get images of stamps with very good provenance. (1) a copy of the photograph shown top right in Ceresa. But notice: the "Seichter" page in Ceresa is a collage. 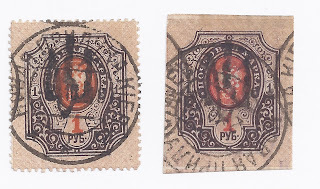 The 1 rouble perforated stamp in the photo at the top is also there in reality as the stamp bottom right. And it looks like a fake. It has what looks like a PETROGRAD 1 EXSP cancellation. The enlarged 10 kopeck stamp at middle left is a photograph. 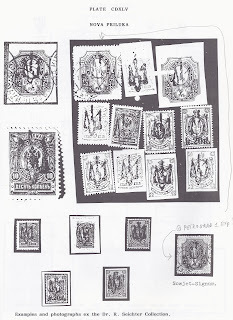 This collage, in my opinion, shows stamps which Seichter believed to be Tridents of Nova Pryluka and stamps he believed to be forgeries or doubtful. Ceresa's page is not one from which we can easily expertise this Trident. 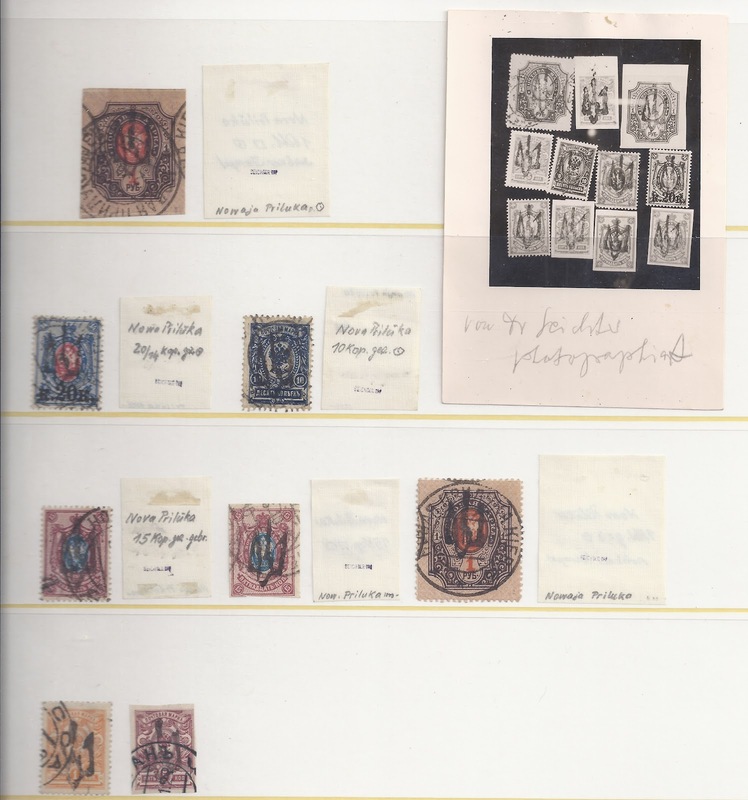 In 1960, Seichter gave a lecture to the Berliner Philatelisten Klub, "Ukraine: Fälschung oder unbekannte Typen? Kritische Betrachtungen über Lokalausgaben 1918 /20". Here he looks critically at (mostly) mint stamps appearing on the market with Beresno or Tchernigow II Tridents. It is my belief that Seichter worked with Schmidt on this problem of doubtful Local Tridents. Schmidt's copy of the photograph of nine stamps is dated on the back "1958". 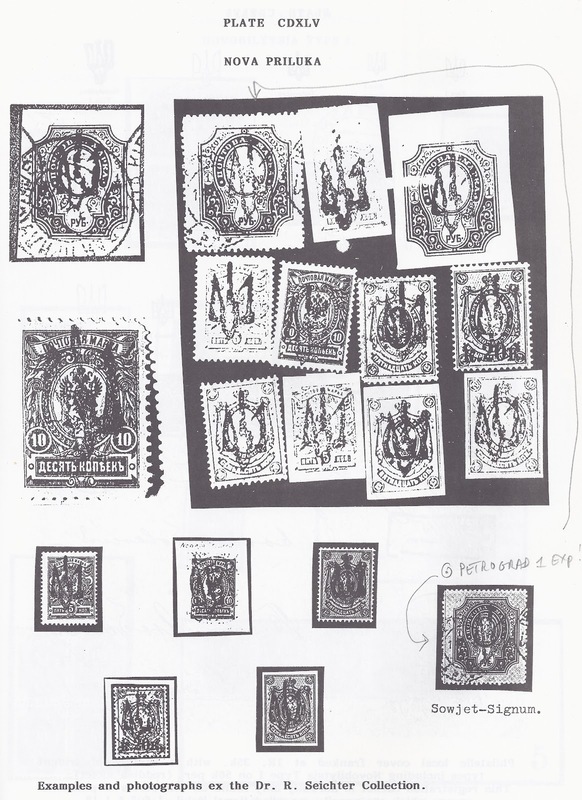 And the six used Schmidt stamps provided Seichter with expertising material for problematic overprints of the Nova Pryluka Trident, such as those shown in the photograph. Each of the six stamps at the top were mounted on small pieces of paper. I think the handwriting may be Schmidt's rather than Seichter's but each piece of paper is signed SEICHTER BPP. The stamps themselves are not signed. The six used stamps I found in Schmidt have a good case to be regarded as authentic. All are on values listed by Seichter and Bulat. 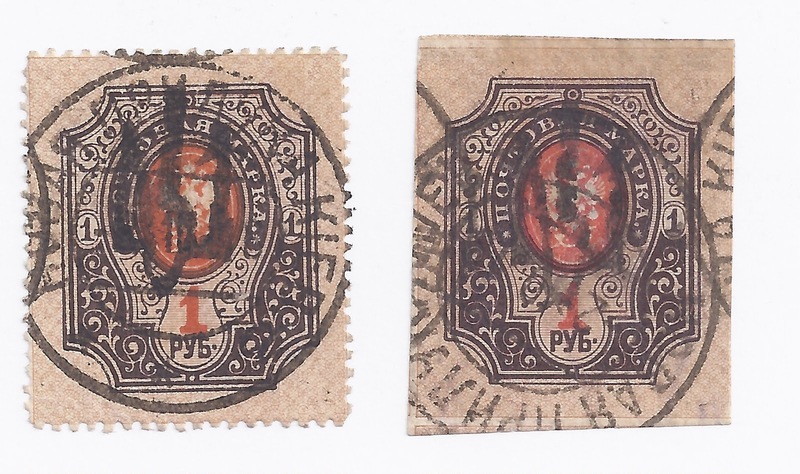 The two 1 rouble value stamps have very good strikes of NOVAYAR PRILUKA KIEV cancels with October 1918 cancels. If these stamps are not genuine Tridents of Nova Pryluka, then none are. Then 15 kopeck perforate has a cancel which begins "NO .." and the other stamps will probably yield to further study. And Dr Seichter signed a piece of paper attached to each stamp - one of those pieces of paper can be seen on the Ceresa page. In contrast, look at the two stamps at the bottom, the 1 kopeck and the 5 kopeck imperforate. These are ex-Lindenmeyer (if I recall correctly) and Ron Zelonka told me they were both fakes. The 1 kopeck perforated is listed by Chuchin 1926 (though not by Seichter or Bulat) and the Trident looks pretty good ... but it has an Odessa cancel. The 5 kopeck imperforate is a listed value for Nova Pryluka BUT here it has a fragment of a 1922 cancel, which kills any idea that it might be genuine just as the PETROGRAD cancel killed the 1 rouble perforated. I am sorry this is a long and boring Blog. What it shows, I hope, is that if you want to collect the more difficult Local Tridents you have to be willing to do lots of detective work - scrutinise every stamp. Not only that, scrutinise the published work.